American taxpayers got to pick up the tab for President Obama's Labor Day weekend travel. According to Air Force documents obtained by Judicial Watch, the flight cost for President Obama’s Labor Day 2014 weekend trips for fundraising, personal business, and politicking came to a total of $1,539,402.10 in taxpayer-paid transportation expenses. The president took trips that weekend to fundraise for the Democratic National Committee in both Westchester, N.Y., and Providence, R.I., which cost $526,192.50. His round-trip from D.C. to Westchester–to attend the wedding of his chef, of course–cost taxpayers $358,490.90. But more than both of those trips was Obama's trip to Milwaukee for a speaking engagement–$653,718.70, all taxpayer-funded, to attend "Laborfest 2014." This Labor Day back-and-forth shows President Obama seems to confuse Air Force One with Uber. President Obama abuses not only taxpayers with this unnecessary travel – he strains an already overstretched military and a Secret Service that is in crisis and can’t even guard the front door of the White House. 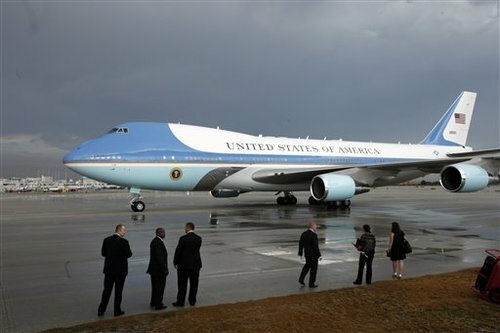 The new Congress could do worse than to reform presidential travel so taxpayers aren’t gouged by candidates and campaigns benefitting from the political use of Air Force One." This entry was posted in Politics and tagged Air Force One, Barack Obama, Democratic Donors. Bookmark the permalink.